For some time now SCX have been augmenting their very popular toy shop range with an annual appearance of a re-issue. Re-issue is a term I use loosely as I’m not sure they use the original moulds? The modern classics are better in detail and finish than the originals and although SCX have always made models that are pretty good straight from the box, their current issues are better again. Little fettling is required to get them to drive admirably! This model is no exception and after a period of drought in their desirable vintage series (the collectors will know what I mean by this!) SCX have come good once again. 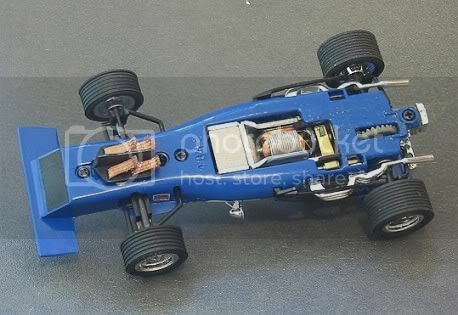 Hoping they have put the dross behind them we can once again look forward to some classic slot cars that don’t have massive motors that make them undrivable on ninety percent of tracks! So let’s start the ball rolling and check this collectable beauty out. The review was conducted with one important consideration. 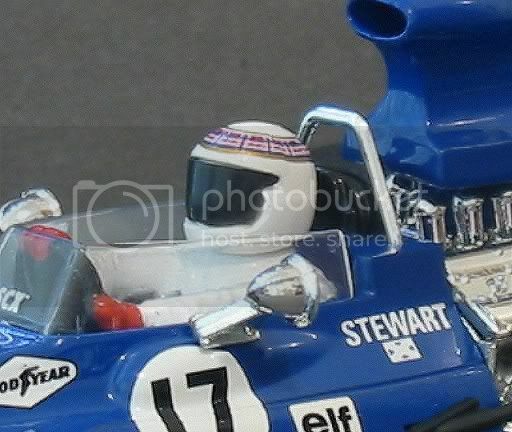 It is obvious that SCX have not tried to remake a perfect replica of the original 1/1 car, this is obvious by the multitude of chromed items on the model. It’s my view they have set out to update the original model and by using some more modern techniques have made a highly drivable and attractive fun car. This car will almost smile at you from the ranks of your collection. The model comes in a very smart and sturdy flip top box. 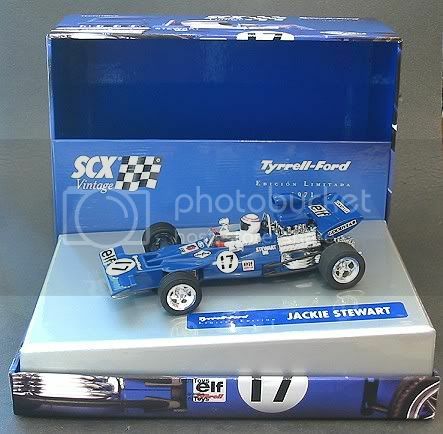 The box also contains a small booklet which give details such as a short history of Tyrell and Jackie Stewart. 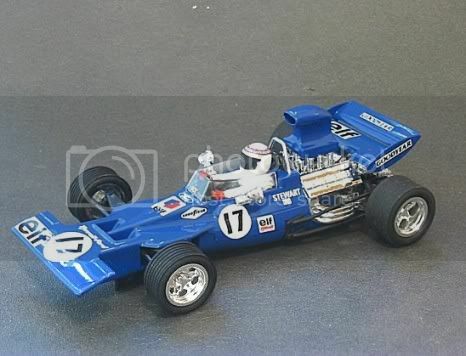 Some information on other motor racing achievements from 1971 and the model specs. in the back. At the business end, SCX have again used the modern version of the old Scalextric RX motor. This carries the designation RX5001. Main differences between this motor and the original RX is the smaller diameter armature shaft, the smaller diameter commutator and deeper motor brushes. 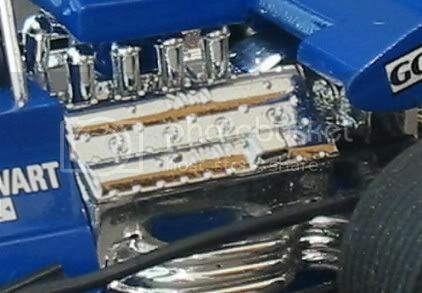 The motor clips very tidily into the chassis and the rear axle is traditionally mounted in brass bushes. The front axle runs in the front suspension moulding which in turn is sandwiched in place between the top and bottom body halves. Another new innovation is the guide pick up system. The original had a hard wired guide and therefore required wires to pass through the body with consequential holes. 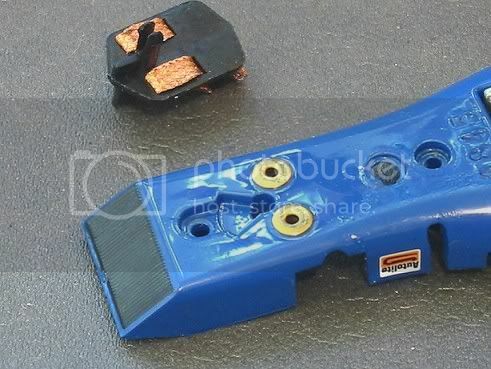 This model has a variation on the sliding pick up system now standard in Scalextric and SCX models. There are a couple of copper rivets each side of the guide mounting hole. These touch the braid on the guide and form a sliding contact. I decided to give the model its work out and straight out of the box, on to the track it went. No lube, no titivating and no tyre sanding or treatment. As always, it was the twenty one metre red lane of my local board track. On forty five ohm controllers the car took a bit of trigger movement before it was off at a good pace. Even though the lane had been cleaned and used for some little while that evening the car showed that its tyres were causing problems. 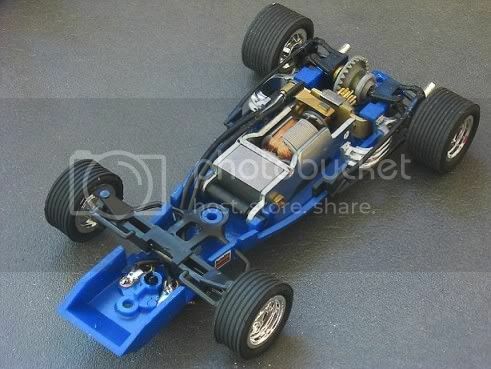 The tyres are the modern SCX ribbed tyres as found on some of their current models. SCX tyres are usually very user friendly on board but inspection of these showed there to be a very definite concave curve on the tread. Probably a result of putting mismatched modern spec tyres on early profile hubs? Continuing in its SOOB form I could only achieve a modest 9.2 secs best lap! The motor isn’t a ball of fire and at best would struggle to keep up with an NC1! But this wasn’t its main problem. After forty or so laps it was time for stage two. Tyre truing! The wheels are not too eccentric and at speeds the motor was running at shouldn’t have presented a problem. The tyres were sanded to increase the contact area to full width. The motor had a couple of drops of oil on the arm shaft and the axle bearings were lubed. Back on the track things were looking up. The car’s behaviour was a lot more acceptable. Acceleration was more positive and cornering a lot more predictable, still with a slight tail out action though and touchy under throttle. I ran it for another forty laps or so and things loosened up and perked up a bit too. The motor became more tractable and the tyres settled down to a good grip. It was now driving to my accepted level for a non magnet car. Good corner speed with a bit of ‘tail out’ and good non violent straight line speed. A best lap time of 8.653 was recorded in this period. Final stage three tuning was then carried out. In this models case there is no traction magnet and not enough advantage at loosening body screws so the only mod left was another tyre truing stint and cleaning of the rubber with pure hydro carbon. Another twenty or so laps saw the best lap time drop to 8.232! not bad at all for a classic slot car. Shortly after this, the “RED TEAM” set up a race to run these new acquisitions. After a great deal of fun and some close racing, friend Garry managed an 8.003 on red lane which is very good for a non mag RX motor. Some points about this model which need further attention are firstly, the rear axle is quite sloppy in the bushes although the bushes are a snug fit in the body! This seems to be a trait right across the board with SCX! Secondly, the front axle is slung in the front suspension moulding which is in turn pinched between the body halves. This allows the front axle to wobble alarmingly sometimes. A short term solution would be to ensure the front tyres are true to reduce this effect. Thirdly, the novel guide pickup system works fine as far as conducting power to the motor is concerned but an instant problem is the guide action being stiff! After a deslot the guide is invariably at one extreme of movement and a bit of fiddling is necessary to reslot the car. No problem for social driving but in a competition this would cause marshall and driver alike a bit of consternation! The car model didn’t demonstrate any bad habits once settled in. Deslots were totally normal and expected and controlled drifting through corners was a delight. There were no broken or detached parts and the RED TEAM all agreed that the model was a resounding success. This ensured it to be part of Friday night racing for some time to come. If you are an out and out racer whos cars have to match your requirements then this car is not for you. It has its limitations but at all times is a very well behaved model when driven inside those limits. If, like the RED TEAM, you are a person who drives a car to ITS limitations for enjoyment then this car is for you. It has very little potential as far as tuning is concerned but in its out of the box form is a pleasure to drive amongst its peers. Front Axle Width			63 m.m. Rear Axle Width		        	65 m.m. Rear Tyre Diameter			20 m.m.